In one swift swing of his mighty left arm, Andrew Johnson provided the fifth-game production Valencia needed. As he pushed out his chest and yelled, he provided the fire and passion coach Kevin Kornegay asked from his guys as they attempted to fend off a Canyon team that wouldn’t go away. Johnson’s kill was one of six he recorded in the match-sealing fifth-game victory, the Vikings winning 3-2 by game scores of 25-19, 25-22, 19-25, 21-25 and 15-11. Boys volleyball: @ValenciaVikings beats @CowboyAthletics 15-11 in game five to take the match. “I think we realized that we weren’t as good as (we thought) we were,” Johnson said. “We had that mentality that we could just come in and blow (them) over.” They couldn’t. 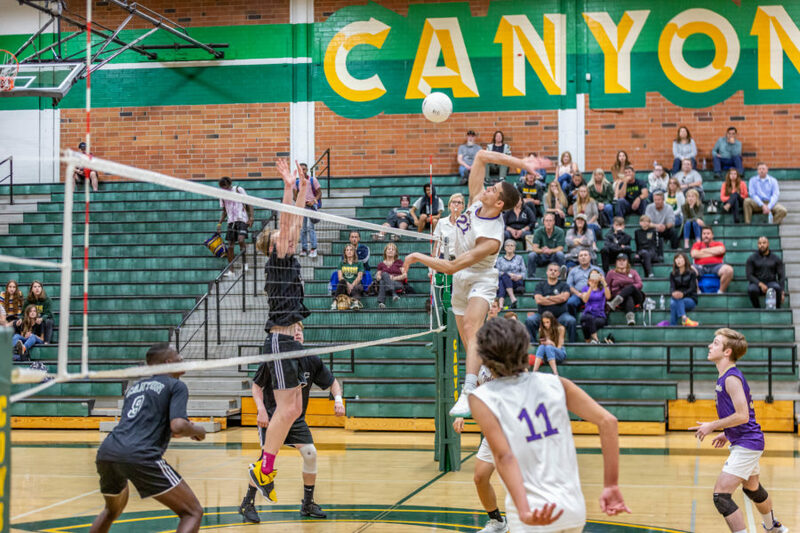 Canyon (3-11 overall, 1-4 in Foothill League) stormed back in games three and four to force a final game to 15. In the huddle before the fifth game, Valencia decided it wouldn’t let this one get away. “Coach just looked at us,” recalled Johnson, “and said, ‘You’re giving this away. You’re not trying, not showing any emotion. … We need to come together and play our game.’” They did. Michael Flores (22 kills) and Cameron Bertolett (15 kills) led the Wildcats (11-3, 5-0), who won by scores of 25-18, 25-14, 21-25 and 25-14 at home Thursday. Saugus is 9-8 overall and 3-2 in league. Dylan Lange led the way with 15 kills for Hart (6-5, 2-3), which won by game scores of 25-17, 25-22 and 25-17 Thursday night at Golden Valley (13-9-1, 0-5).